Sure, I am not the biggest Star Wars fan. Not by a long shot. But I do have a mild admiration for the first original trilogy, which made quite an impression on my younger self (he is Lukes’ father! Go figure). And like most people I can look past the quality of the later trilogy. So last years’ Star Wars movie (I guess that’s a thing now) was a bit of a revelation. Familiar faces and a familiar feeling. It was fun! So expectations were set for Rogue One. Yes, I know it’s not part of the new trilogy and all that. But when fanatic Star Wars fans told me this was their favourite one, I got pretty excited. So I went to see it and…… I did not enjoy it. Let me explain! The movie was way too serious. A big part of the Star Wars charm (that feeling), for me, is the kind of light-hearted humor, embodied perfectly in a character like Han Solo. Kind of a screw up, but talented. Getting in situations way over his head, but also getting out. But also the wookie that will kill you when you’re not careful. The brother and sister that don’t know they are yet. And other little things like Yoda, riding Luke Skywalkers’ back. Or Jabba the Hutt, as scary as he is supposed to be, there is also something funny about him. But this movie has no humor, the main characters never even smile or surprise each other. Yes, it is a Sci-Fi movie about space and war all that, but what set out Star Wars was always a human charm. And the original characters each embody part of that. The group balance between their independent qualities was pretty perfect. This looks pretty cool though. I found it hard to care for the two main characters in Rogue One. They seem to lack ‘character’, and I thought they were very one-dimensional. Partly because of the acting (not very good, and the Spanish and British accents throw me off). And partly because of the story. There is little to no backdrop to get to know most of them and there is a lack of interesting dialogue between the main characters. Sure there is an intro from when Jyn Erso was a small girl. But that was way too long, I would have rather seen what happened to her when Saw left her (as is only mentioned briefly). Because that would probably explain who she is better. K2 was alright and responsible for the only laugh (‘congratulations, you are being rescued‘). But that was about it. No wookies (just one split-second shot), no ewoks, no Yoda etc. To give it that Star Wars feel. The fact that I didn’t care for the characters was affirmed when I didn’t really mind them dying. The beach scene, after the Death Star hits that planet, it was kind of meh. It was not a tearjerker. I was not ‘invested’ in those characters and it was already expected that they would die. Because most main characters die in this movie: the mom, the dad, the daughter, the rebel guy, Saw Gerrara, the bad guy, they all die. (did I mention this movie was way too serious?). I think they try to make up the lack of dialogue, human interaction, character building with a lot of action. Too much for my taste. Sure, it was nicely done. Top level CGI. But not something I hadn’t seen before (seeing the Walkers in battle was nice though). But my attention span can only take so many lasers and air fights. It felt off balance. So, yeah this is not a movie I will re-watch any time soon. And this probably says more about me than the movie. Real fans seem to enjoy it, good for them. I didn’t. 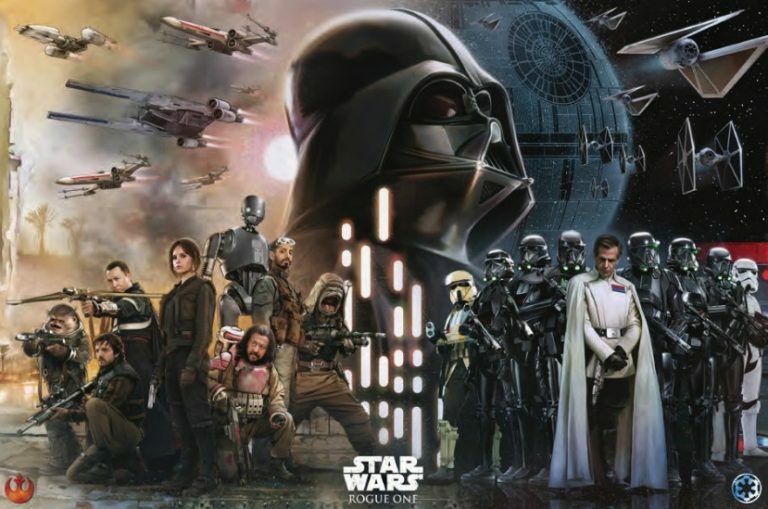 I didn’t like it as a Star Wars movie (that bar is high) but I think I also didn’t like it as regular movie. I didn’t watch trailers, and knew as little as possible going in, because I like to be surprised by the movie. So maybe I’m missing something? Feel free to let me know! They marketed is as a gritty war movie and they kept their promise. A much darker tone than The Force Awakens, which was meant for the whole family. This one, not so much. Would love to see a director’s cut some day, because it seems the film had some tumultuous last weeks of filming. I’ve seen it twice and the film suffers greatly from diminishing returns, but I guess that is to be expected from a spinoff movie. It’s true that the story has much less depth than any of the classics but the worldbuilding makes up for it. Also this movie helps establishing the might and unstoppable force that is the Empire before perfectly leading us into A New Hope, which I found to be the best part. Also, K2S0 is one of the best things rolling out of a droid-factory ever. But what made me appreciate the movie the most is that the antagonists do the stuff I myself would want to do in my Star Wars role playing game sessions. Guess that makes me a Star Wars fan then.